The Crimean football union (with special status) in its activities strictly adheres to the principles of mutual respect between referees, footballers and supporters, the principles of the variety of relations integrity between people, Laws of the game and nobleness. Accordingly, the CFU against propaganda and manifestations in all forms and ideas of racism, xenophobia, Nazism, neo-Nazism and so on. That is why, the Crimean football union decided to carry on the Crimean campaign "We respect each other! Football against racism" to promote the principles of mutual respect and tolerance, as well as promote the principles of social football responsibility. We believe that football should unite people and make them forget about differences. There must not be violence in football, neither on the field, nor in the stands. Football should be an example of respect to the principles of variety of our live. In accordance with UEFA recommendations, was developed and approved a sign of the campaign. The ball at the heart of the sign, as a symbol of the game, which unites people not just on the football field and supporters in the stands, but also millions of those who love the most popular game in the world. There are no barriers or racial differences for such game. The sign is located on the red field. Red color symbolizes energy and strength. 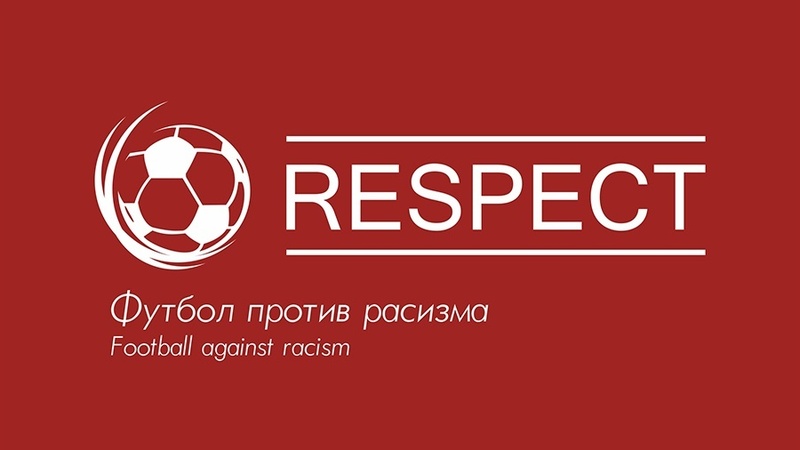 The font sign "Respect" expresses the core of the whole CFU campaign "We respect each other! Football against racism".